One thing that I desire as a mom is for my children to be friends. I want them to learn to love each other today and be true friends when they are adults. 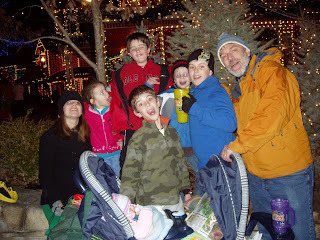 With seven children in the house sometimes it feels like all I do is "survive". After reading A House Full of Friends by Susan Alexander Yates, I was challenged to begin to build routines and celebrations into our family that will hopefully encourage friendships. Our home is filled with the typical sibling rivalry experienced by most, but my hearts desire is to be intentional about providing opportunities to grow friendships in our family. One way I have done this is to begin praying for my children to be friends. My prayer is that their friendship will last a lifetime. Birthday Posters - A day before the birthday celebration for one of our family members I get a poster board and everyone works together to create a "Happy Birthday Poster". I have also started letting the children decorate the house with streamers and even to bake the cake and decorate it too. (I must admit I had a hard time doing this because I love to do it and - I like it done neatly!) They have found great joy in being a part of getting the celebration ready. Birthday Cards - Along with the poster each child (and parent too) get a blank card and decorate it for the one we are celebrating. It gives those doing the artwork a chance to be creative, and to share how they appreciate their sibling. Special Blessings - I have tried to look for ways to have my children bless their brothers and sisters by celebrating special achievements or events. One example was when Courtney tried out for the play at school. She had a minor role and was an understudy. We wanted to let her know that we think she is a "star". 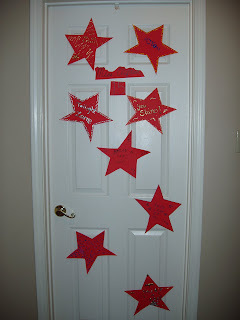 On opening night we decorated her bedroom door with stars...so it was a "Star's Dressing Room". Each of us decorated a star with puffy paint and a short message for Courtney. It was fun and it spoke volumes of love to Courtney (the play was months ago and those stars still adorn her door). 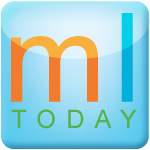 Attend Sporting Events - I love watching kids play sports, but it is a challenge with little ones. I cannot count the many times I have missed their one basket of the season when taking care of the little ones during the game. There have also been times when only one of us have gone to the game. It is so much easier to leave one parent at home with the little ones. However, we decided that we all need to be there to cheer on the one in the game (or on the sidelines). I know I have a long way to go in the daily encouragement of friendship but focusing on special celebrations has been a great start in encouraging their friendships with each other. What do you do to encourage friendship with your children?